GLASTONBURY, Conn. – Lawrence Ford, Founder and CEO of Conscious Capital Wealth Management™ (CCWM), has been named Business Person of the Year by Peace Island Institute an international Civil Society with chapters all over the world which is dedicated to promoting world peace, education and health, social work, interfaith dialogue, environmental awareness and social responsibility. 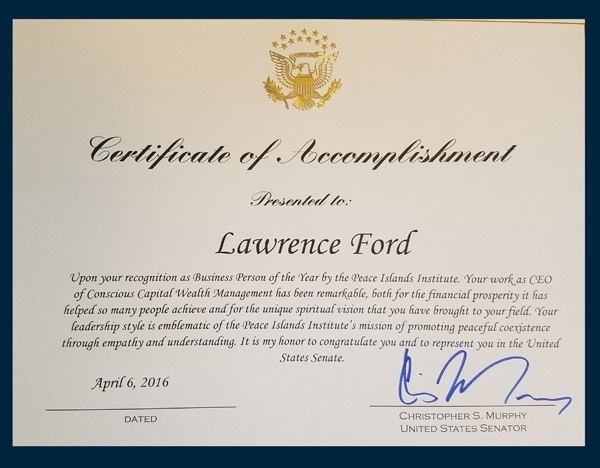 Mr. Ford was recognized by the CT Chapter at their annual Friendship Dinner and Award Ceremony held in April 2016 in New Haven, CT.
Mr. Ford joins other distinguished business and spiritual leaders who have been honored in years past such as, Governor Malloy, U.S. Senators and Congressmen. Since 1989, Ford helped more than 5,000 people achieve personal prosperity through his work and beliefs that we are all on a journey into power and when possible live a life of passion and purpose. He brings this thinking front and center into his Whole AdvisorTM approach at CCWM which is redefining the investment experience as we know it today. It allows clients to easily define their dreams and how to get the most out of their financial assets and from life itself. Larry encourages his clients to use the power of money to make the world a better place. Conscious Capital Wealth Management (CCWM) is a full-service wealth management firm with a national scope that focuses on bringing clients into their own power by recognizing to live a life of passion and purpose. Through the Whole AdvisorTM team, clients are taken through a unique 3-Step Process of Connect – Dream – Empower– all geared towards using the power of money to make the world a better place and allow client’s dreams to be fulfilled. CCWM is an independent SEC-registered investment advisory firm, headquartered in Glastonbury, CT with offices in Westbrook, Westport, CT and St. John U.S. Virgin Islands. Securities offered through J.W. Cole Financial, Inc. (JWC) Member FINRA/SIPC. Advisory Services offered through Conscious Capital Wealth Management, LLC (CCWM). JWC and CCWM are unaffiliated.